Abt Electronics, reported to be the nation’s largest single-store appliance and electronic retailer, played host to a launch event for the latest line of Dynamo subwoofers from MartinLogan, on Thursday, June 28th, at 6:00 p.m. in its Glenview, IL, space (some 10 miles north of O’Hare International Airport in Chicago). Before I describe the event, I’ll begin with an overview of the Dynamo subwoofers’ new technologies and features. First introduced in 2009, Dynamo subwoofers have been the most successful product category in the manufacturer’s 35-year history, and this fourth generation of powered Dynamo products represent the most advanced, high-performance, affordable subwoofer systems ever brought to market, says MartinLogan’s marketing manager, Devin Zell. The lineup now offers five models—the Dynamo 400 ($399), 600X ($599), 800X ($799), 1100X ($1099), and 1600X ($1699)—wherein the 400 is intended to be a cost-effective subwoofer solution, while the X’s in the other names signify those models’ advanced wireless technologies: app-based controls via Bluetooth, Anthem Room Correction (ARC), and even optional wireless signal connection capability. This latest generation of MartinLogan Dynamo subwoofers use Class D amplifiers, and feature low-noise, high-power switching power supplies in addition to high-quality MOSFET transistors, transformers, noise-suppression networks, and control circuitry. Although the 800X, 1100X, and 1600X come out of the box pre-configured for downward-firing, they can quickly be converted to front-firing mode by moving the footers and using the included grille. In the Dynamo 800X, 1100X, and 1600X models, the footers include removable rubber caps to employ the included custom ETC (Energy Transfer Coupler) spiking system, to enhance stability on thick carpets, or to create tighter coupling between subwoofer and floor. When the subs are configured to fire downward, the inverted surrounds found on all their new drivers are designed to reduce airflow-related turbulence and enhance linearity. Pairing a high-powered magnetic structure (improved over that in the Dynamo's previous generations) with low-mass diaphragms helps allow smoother non-resonant response. The stable, rigid enclosures are constructed from composite materials with structural cross-bracing in critical areas to help minimize cabinet-induced resonances and non-linearities. While the Dynamo 400 and 600X feature tuned, low-turbulence ports, the Dynamo 800X, 1100X, and 1600X are sealed systems. The Inverse Mathematical Equalization (IME) filter used in this new Dynamo series is derived from the inverse of the unfiltered driver response. Precision IME filtering is said to yield extremely accurate low-frequency response superior to that provided by the simple second-order high-Q filters typically found in other subwoofers in this price range. MartinLogan’s new Subwoofer Control app for Android or iOS, free from your app store, enables control via a Bluetooth connection from your smartphone or tablet to simplify setup and configuration. The app is comprehensive, allowing for remote control of the sub’s volume level, low-pass filter (adjustable frequency and order), infinite phase control (not just 0° or 180°), and room gain. It offers three preset listening modes and allows use of a passcode lock to prevent inadvertent changes once you have dialed in your setup. It also offers a tone sweep feature that can be paused at any frequency to assist in locating troublesome rattles or resonances in your listening room. And using the Anthem Room Correction (ARC) with its free mobile app (via Bluetooth or a USB connection with a PC) couldn’t be easier. The system measures the sub’s low-frequency output in your room, compares it to optimal response curves, then, using Anthem’s advanced algorithms, applies corrections to remove anomalies, moving as close to the ideal standard as is realistically possible. MartinLogan didn’t skimp on wired connectivity either: These subs offer left and right input via RCA line-level or speaker-level connections. The right input on both the Dynamo 400 and 600X doubles as an LFE input for home-theater application, while the Dynamo 800X ups the ante by adding a discrete LFE RCA line-level input, and the Dynamo 1100X and 1600X go one step further, adding both XLR and RCA inputs for the LFE connection. The Dynamo 800X, 1100X, and 1600X systems allow simultaneous connection of both two-channel stereo music and multi-channel home theater, allowing each source to have individual crossover and level settings. While LFE inputs use no low-pass filter (leaving crossover control to the processor), left and right inputs integrate discrete user-adjustable low-pass filters allowing different level and crossover points when playing back two-channel music. For further placement flexibility, MartinLogan’s new SWT-X Wireless Subwoofer Kit (sold separately, $199 each) installs easily in any X series Dynamo, and incorporates the latest 2.4GHz dynamic frequency selection, forwards error correction, and has a range up to 50 feet. Finally, the Dynamo 800X, 1100X, and 1600X feature 12V Trigger Inputs, allowing an external device to turn the subwoofer on and off. For more information, watch MartinLogan’s YouTube video describing this new series of subwoofers. 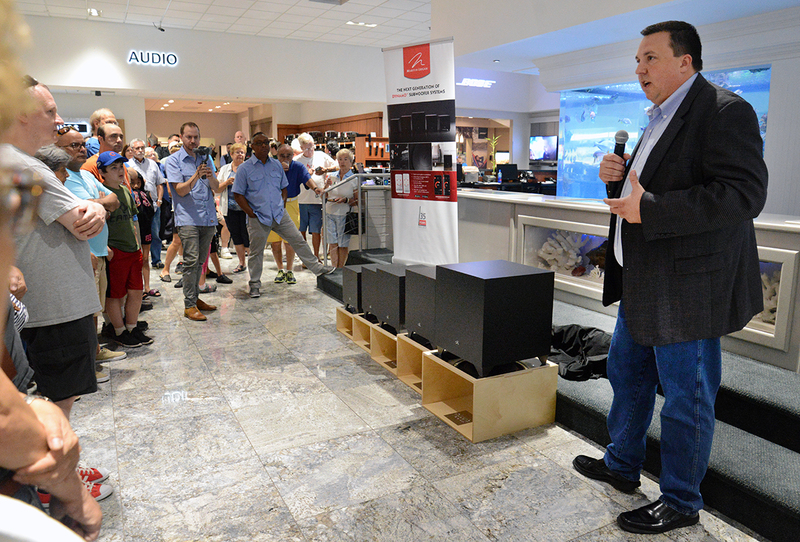 The event was held in Abt Electronics' Audio section, a large, beautifully appointed, and carefully laid-out department of what (as I’ve mentioned) is the most enormous single-store electronics/appliance retail space in the nation. This was my first visit to this sprawling super-store of 400,000 square feet (including attached warehouse and installation bays), with a staff of more than 1400 employees. In business continuously since 1936, Abt does all its own deliveries, installation, and service calls. While event-goers enjoyed catered hors d’oeuvres and beverages, I met with Devin—and then with other MartinLogan and Abt team members—who mentioned that over 500 people had registered for this event via their social media feeds. 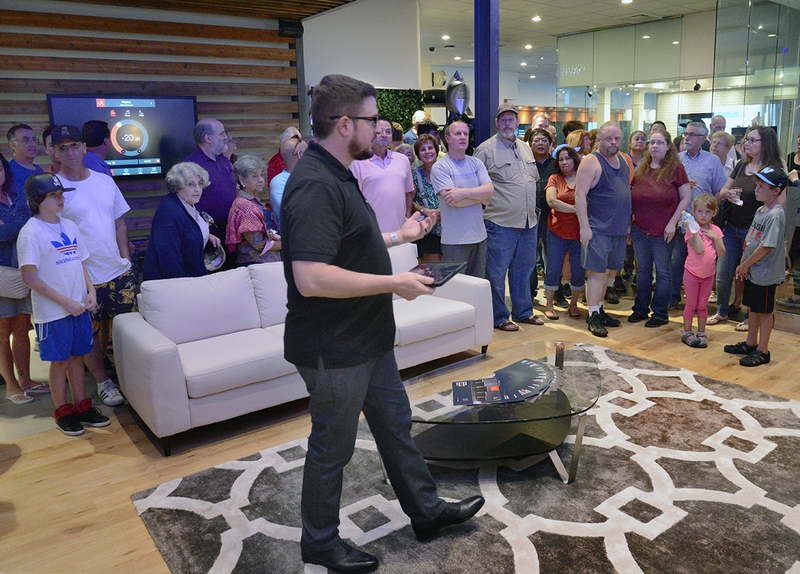 Roughly 125 people pressed in for the reveal of the new Dynamo subwoofers: one of each model had been under cover for the ceremonial unveiling that kicked off the presentation. After the unveiling, MartinLogan Product Manager and Trainer Andrew Lindsey (pictured below) gave a detailed presentation of the technology found in the Dynamo subwoofers, as well as an engaging demonstration of how easy they are to set up and manage using the MartinLogan Subwoofer Control app. The screen from his tablet showing the mobile app was cast to two large-screen TVs in the listening/demo area, allowing everyone to see how the user-friendly app works. This was followed by an impressive demonstration of a pair of the Dynamo 1100X subwoofers in another home-theater showroom, where selected scenes from the Blu-ray release of the Marvel Studios blockbuster Black Panther were shown. 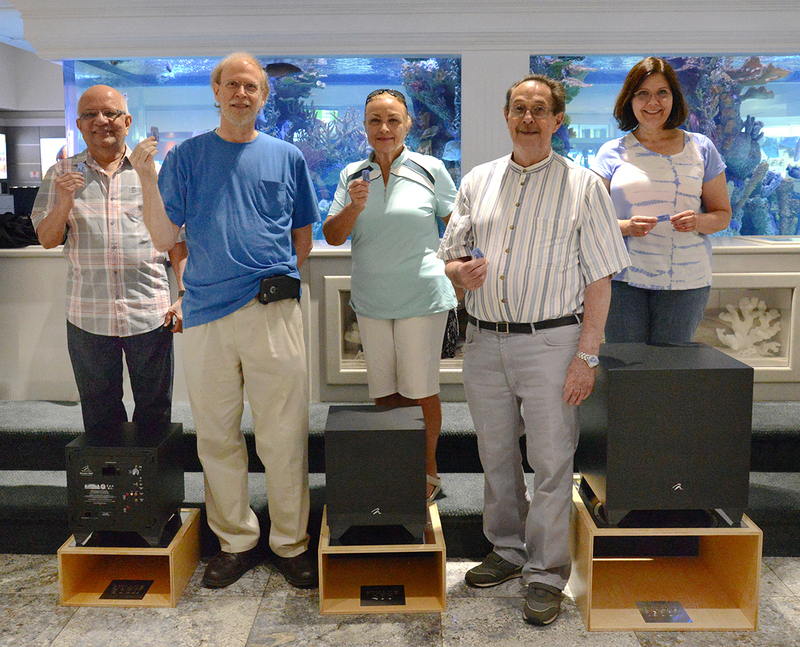 The event closed with a raffle—$50 Abt gift certificates were given to randomly drawn winners (pictured below), and five lucky attendees each received one of the five new Dynamo subwoofer models. It was quite encouraging to see such a well-respected, established manufacturer such as MartinLogan going all-out to engage the public by promoting such a fun, educational, and generous event. It’s such a direct and effective way to connect with listeners, many of whom may otherwise never discover the enjoyment of quality sound reproduction in the home (or in the case of existing audiophiles, even lose interest in the hobby). Events like this can be one of the more effective ways, albeit at a grass-roots level, to sustain and grow interest in our industry. It is my sincerest hope that more manufacturers will follow this lead. The entire experience of this unquestionably successful event was streamed live on Facebook, and can be seen here.